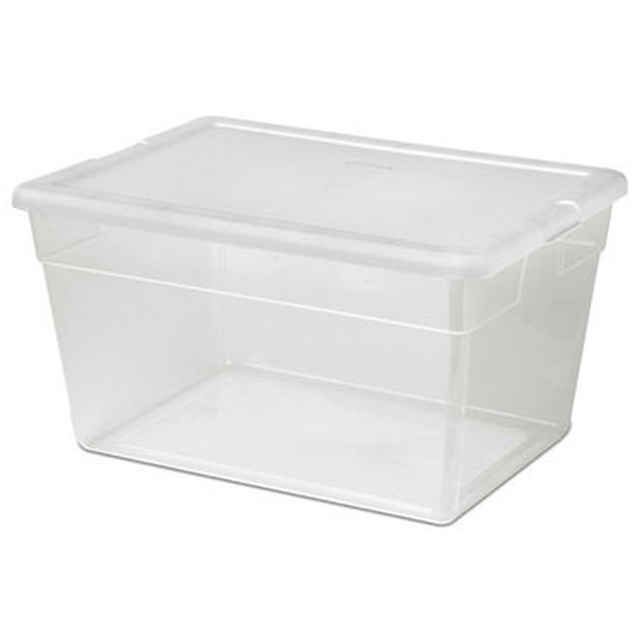 The Sterilite 56 quart storage box is a large clear plastic tote. Capable of holding up to 14 gallons of storage, this clear plastic tote can become home to many items. Use the Sterilite 56 qt storage box for blankets, clothes, or books. The clear plastic tote can also work well for kids toys, dvds, or even craft supplies. Save time with this large plastic bin and other clear plastic totes by not having to sort through hard-to-see items in cardboard or solid-colored boxes. Take advantage of bulk case pack pricing for this Sterilite 56 qt storage box. See also: Home Storage Boxes and Plastic Boxes with Lids.